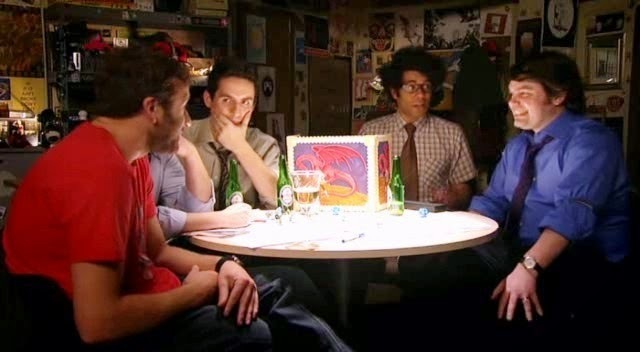 Ever have your group surprise you by taking a totally different approach to something? They’re sneaking into a temple where the villain’s presiding over an unholy ceremony and you stress that they are vastly outnumbered. But instead of sneaking around and trying to disrupt it, they decide a frontal assault would be best. They do exacting research for a job that should have just taken some quick thinking and light fingers. …And then your session gets all derailed (get it?) because, narrow-minded game master that you are, you only foresaw this scene playing out one way. Everyone comes to the table to express themselves. Whether you’re using it as a rules system or not, FateAccelerated provides you with a no-miss prep tool here. In an effort to make rpg rules so simple that anyone can pick them up right away, Fate Accelerated conceptualizes all actions as approaches rather than skills. So when you’re planning a situation, envision six different versions of how it might play out – one for each approach. Of course, these approaches are intended to reflect individual characters’ approaches to situations – but in any situation, the party as a whole is sure to basically use one approach or another. In the first example above, the party used a Forceful approach when you were expecting Sneaky. In the second, they used Careful when you expected Clever. And in the third, they used Flashy when you expected Quick. Let’s say last week you left off with the party hiding in some secret passages, preparing for the final boss-battle. Plan this going down in six ways. The PCs might play it Careful – think up a “one weakness” for the boss, so the PCs can “find out about it” if they decide to do some research. The PCs might play it Clever – be ready for them to take the villain hostage in his dressing room. Does the villain have a dressing room? He does now – and (of course) it has a very expendable contingent of bodyguards in front of it. The PCs might play it Flashy – prepare the NPCs’ reactions if your party decides to just boldly walk on in and start talking smack to the villain. What will the minions do? What will the villain say? Most importantly, what are some ways that what happens next isn’t instant death? Being at a loss for this stuff can chew up a lot of time. The PCs might play it Forceful – prepare for what will happen if the PCs try a frontal assault. What opposition will they face? What strategic advantage will you put within their reach that might make them not die? The PCs might play it Quick – if the party decides to open up with arrows and flashbombs to give the appearance of a larger attack force, what dynamics will you use to represent the ensuing confusion? How long do they get before the bad guys wise up? What’s their path to the objective while everyone is bumbling around? The PCs might play it Sneaky - if the party expresses the desire to knock out some henchmen and put on their robes, be prepared with something more interesting than “yeah, you, uh, grab a couple guys on the edge of the crowd. Nobody notices, I guess.” Give them a scene where a detachment is marching down a hallway and they can pick off the stragglers. Plan something for all of these approaches. If any of them require extra setpieces (like a “Room of Tomes” to access and do research in) sketch them out – even just a little – in your notes. Is this going to predict every possible course your players might take? Of course not! But it will at least put you into the mindset of thinking flexibly (I mean, hey, I just made up those six approaches right now while writing this, using the Six Approaches as a guide), so that you won’t be completely bewildered no matter what they do. 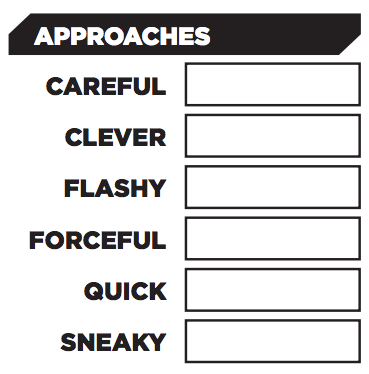 A note: some of these approaches require you to rewrite the backstory a little – like giving the boss a “one weakness.” As long as it doesn’t contradict anything the players have already heard, that’s ok – you’re just flexing the story to fit what they want to experience. Everyone comes to the table to express themselves. And, as long as a player is respecting the group, you should always let the story go in the direction he wants it to go. The approach that a player uses is not just his character’s personal style; it’s often the summation of the things that captivate that player the most about this gameworld. Thus the approach a player uses in the story is usually more than a mere strategy – it is often a prized possession they are sharing with the group. When they use an approach you didn’t think of, be in awe – this is their moment to shine.